This week Power Elements Of Character Development, the second ebook in my Power Elements Of Fiction series, is benefiting from Amazon’s Kindle Countdown Deal, a unique promotional program. Or perhaps I should say, writers who wish instruction about character development will benefit. The way this program works, Power Elements Of Character Development is on sale today only for $.99. Yep, that’s less than a dollar. There aren’t many things we can buy these days for less than a dollar, even at a 99 Cent Store, so this is a real bargain. Tomorrow the deal isn’t quite as sweet, but will still be a great buy—the book will be on sale for $1.99. That’s a fifty percent discount, so obviously, it’s still a nice deal. Thursday the price increases another twenty-five percent—to $2.99. But yes, that means those who buy will still enjoy a twenty-five percent saving. Finally, on Friday the price will revert to its regular $3.99 rate, which, as books go, still provides a significant amount of important instruction for a modest sum. Lastly, I’d appreciate any reviews from those who have read or who will read Power Elements Of Character Development. When readers talk about the book, it helps those trying to make a decision know if this book is for them or not. Oh, yes! The last thing I want to teach is building characters using a type-casting approach! For those of you who have already bought the book, perhaps you’d consider sharing with others this week’s special pricing so other writers who would like to create the best characters possible can benefit. Thanks in advance for helping to get the word out. For the most part, my writing tips deal with fiction, though some principles are true to writing of any genre. I’m departing from the norm today and introducing a contest—a poetry contest, of sorts. 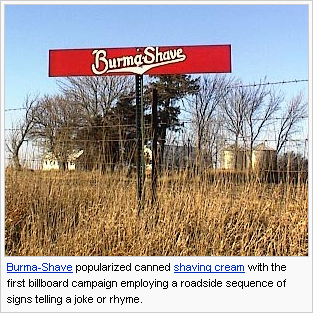 As part of my promotion for the new Power Elements Of Fiction volume, Power Elements Of Character Development, I’ve decided to use the old ad idea put out by a shaving cream company called Burma-Shave. Their ads are actually a bit of Americana, some preserved in the Smithsonian Institute, sort of like Norman Rockwell paintings, only in poetry. The ads first appeared on small signs along the highway in Minnesota back in 1925 and continued until 1963. The son of the owner of a mom-pop kind of company producing, among other things, shaving cream that could be applied without a brush, came up with the idea. He spent $200 to put up signs that first year. Sales shot up, so the next year, his dad authorized more signs, and the ad campaign expanded. 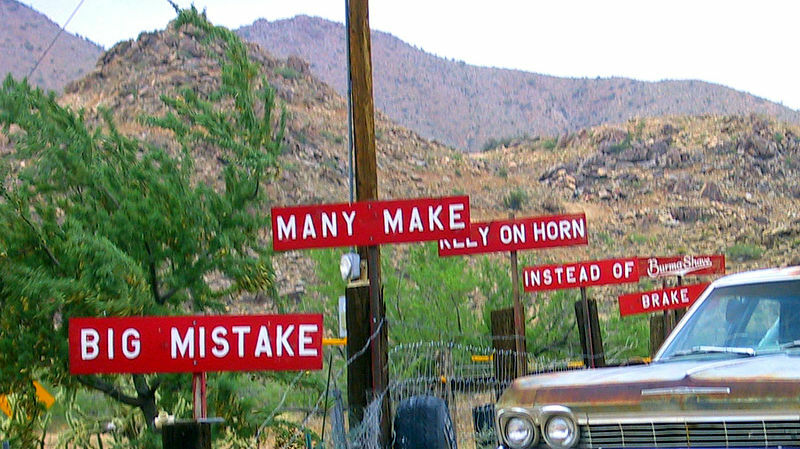 Eventually Burma-Shave signs cropped up in 44 of the lower 48 states, all positioned along the highway, so that roadtrippers could read them. The ads were actually jingles—short lines of poetry, often with a twist at the end, and often with a bit of humor, though not always—toward the later years, they often gave driving safety tips. My idea is to use the Burma-Shave ad concept to help promote Power Elements Of Character Development. So I sat down to write some jingles. Except, what I have to admit is, I’m not very good at it. Consequently I thought, there have to be writers out there better than I am. What if I hold a contest, offering a copy of the book as a prize for the winner? So that’s what this post is all about. For any and all who would like to try their hand at writing Burma-Shave type jingles about Power Elements Of Character Development, put your efforts in the comments section below. Moderation is on, so I alone will receive your entries. I’m contemplating a second, third, fourth, and fifth place prize, but I’ll let you know about that once the entries start coming in. I don’t know if there will be five or fifty and I don’t know how many will be ones I can use for the promotion. But let me show you mine so you can see, you don’t have to do much to make yours better than mine. *Sad truth! I know this may seem hard to do if you haven’t read the book, but you can see the table of contents by using Amazon’s look inside feature to get some ideas that will reflect the content of the book. I’m looking forward to whatever you submit. This should be fun. I’ll just add that by submitting, you’re giving me permission to use your entry as part of the promotion for Power Elements Of Character Development. 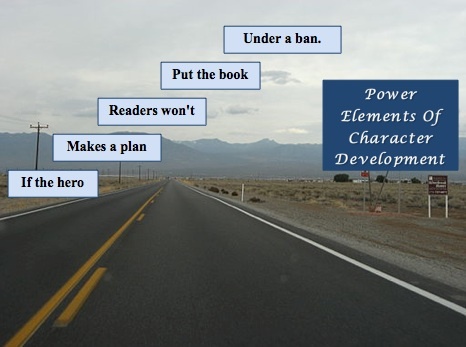 Back in March, I posted a preview of the Kindle ebook Power Elements Of Character Development, Book 2 in my Power Elements Of Fiction Series. Before I could put the book up on Amazon, I needed to work out some technology issues which took far longer than I expected, but at long last, it’s complete. So I’m happy (and relieved) to announce the release of this new book, with the actual cover, not the pre-release cover I posted before. As part of the promotion for the book, I’ve made Book 1, Power Elements Of Story Structure free for a limited time—until midnight Tuesday, May 19. By the way, here’s your chance to critique an editor, something most writers would LOVE to do! 😉 If you download and read either Story Structure (the free one) or Character Development (the new one), you’d help me out a great deal by writing a review—whether you like the book or hate it. Power Elements Of Character Development, second in the series Power Elements Of Fiction, offers practical instruction for fiction writers about how to create engaging characters. This manual covers such topics as the character arc, a character’s inner as well as outer goals, qualities that make a character compelling, how character development fits with plot, how setting affects character development, character flaws, character voice, well-developed minor characters, realistic antagonists, and more. This guide provides helpful reminders to the seasoned author, tips to help the intermediate writer raise the level of his storytelling, and instruction for the beginner. The occasional writing exercises offer writers an opportunity to apply what they are learning to their own works in progress. Finally, Power Elements Of Character Development includes a list of resources for authors who wish to dig deeper in any given topic. In total, this manual is a succinct blueprint for fiction writers to create characters that intrigue, entice, and compel readers to follow their story. Critical to the process of creating a story that matters is creating characters who matter. Readers must care about the people in a story in order to care about the story itself. However, readers will put down books that are nothing more than long-winded character sketches. Something has to happen, but it has to happen to characters who matter. * Strong, yet vulnerable. The character is capable, admirable, winsome, but has a touch of weakness that makes him realistic as well as endearing. It’s a bit like Superman disguised as Clark Kent. Bilbo is another good example of this type of character. He was small and not so very adventurous. He didn’t have any experience away from the Shire, but as Gandalf pointed out from time to time, there was more to him than met the eye. He was smart and intuitive and persistent and loyal. He was not invincible, but when he became invisible, it nearly seemed so. Yet Gollum could hear him and Smaug could smell him and the elves of Murkwood knew someone—a great warrior, they thought—lurked in their halls. But if Bilbo were a man or a dwarf or an elf instead of a hobbit, he would not have been as endearing. His fuzzy feet and love of second breakfasts made him seem less than ferocious. His vulnerability was the perfect counterbalance to his strength of character. * Influential. The protagonist isn’t a follower. She is generally the trendsetter, the leader, the catalyst. She sees the solution when no one else can, takes the path least trodden, faces the insurmountable odds when everyone else runs. She is the one who sets herself apart with her choice for a career or her choice to renounce her career. She’s willing to go it alone or sacrifice for others or try the impossible. Readers admire her confident leadership. The protagonist in L. M. Montgomery’s Anne Of Green Gables is such a character. Though Anne tries to conform to the expectations of her adoptive parents, tries to fit in with her classmates, tries to stay out of trouble in their small community, she simply has too much imagination, too much ingenuity, too much power of persuasion. She draws people to her like a magnet draws iron, and she woos and wins the hardest heart, the strictest disciplinarian, the greatest tease. She turns enemies into friends and friends into bosom buddies or kindred spirits. * Active. The main character must not exist to experience whatever befalls him. He must take the initiative, decide to engage his world, and, for right or wrong, make things happen. Along this line, he is self-aware. He knows he has weaknesses and wants to overcome them. In fact, much of what moves him to act is his desire to be better than he knows himself to be. Lady Marguerite St. Just Blakeney, the heroine in The Scarlet Pimpernel, Baroness Emmuska Orczy’s historical novel set during the French Revolution, as well as her husband Sir Percy Blakeney, is an active character who does not merely react to events threatening her, but takes steps to forestall evils. Percy is crafty, daring, beguiling, a protector, a rescuer, a leader. He sees people dying in France for no reason other than their parentage or perhaps because of those with whom they had some past association, and he determines to help them escape. Marguerite does what she does for love—first for the sake of her brother and later for the sake of her husband. She is no less courageous and daring than Percy, though perhaps not as duplicitous. But both of them are active. They take the fight to the villains and because of their willingness to act, readers readily cheer them on. Strong, yet vulnerable; influential; active: these three traits are at the top of the list of qualities that make a character matter to readers.